London, 1838. The handsome Earl of Somersby may just be the most eligible bachelor in London, but has no interest in a wife. 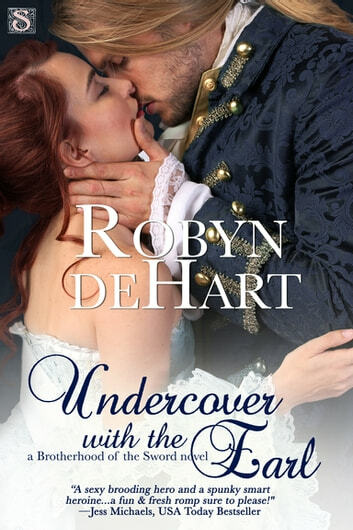 As a member of the Brotherhood, Bennett Haile is far more vested in his undercover duties for the crown and protecting the Queen from would-be assassins. For now he has the perfect tool with which to lure out the villains-a young woman with an uncanny likeness to the queen. The spirited Evelyn Marrington is about to live out every country girl's dream-becoming royalty overnight. Under the tutelage of the arrogant Earl of Somersby, she'll have to fool the entire court that she is, in fact, the queen. But as danger threatens from every side, Bennett realizes that his lovely little protegé isn't just placing her life in his hands... She's stealing his heart. The Brotherhood of the Sword series is best enjoyed in order. I really liked both Evelyn and Bennett. They both think that they are not looking for marriage. Evelyn because she doesn't think she is attractive or desirable, and Bennett because he doesn't believe in love or that he is lovable. As they work together to keep the Queen's secret, they help each other believe in a different future than what they had planned for themselves. My only complaints are that the story was too short to fully develop the covert mission and there was no resolution to the mystery behind who was behind the attacks. I'm hoping that the reason behind it is that storyline continues into the following books in the series. Overall and enjoyable read. I received an ARC via NetGalley for the purpose of an honest review. I was not compensated for this review, all conclusions are my own.